Sometimes we all just need to give ourselves “a hug”! I am not talking about wrapping your arms around yourself, but something called a Herbal Hug. These are one of the best natural products that I have used when I am feeling under the weather. I reviewed a few of their products back in May and am STILL using them when I have a headache or the dreaded neck pain that hits me every so often. 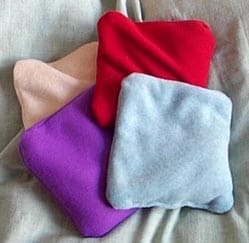 A Herbal Hug is a soft, polar fleece filled bag with Canadian grains, dried herbs and essential oils. They use a special process that infuses the scent into the grains so that they will last you a long time. Fleece is used because it is soft, durable and easy to clean and it has great thermal retention and feels good directly against the skin. Lavender– great for bedtime and for aches and pains. Herbal Mint– good for sore, aching muscles, headaches, colds. Rose & Chamomile– good for when you aren’t feeling well; comforting and soothing. Natural– for those who want the natural thermal therapy but prefer scent-free. I already knew that this product worked well for me from my previous review, but I hadn’t tried a Herbal Hug in the natural scent so I was curious to see how this one would be for me. Nancy Galway, BSW, RSW, who is an aromatherapist and owner of Herbal Hugs sent me a Body Pack (in natural scent). I thought it was pretty neat that Herbal Hugs is a Canadian company and all their products are made in Ste. Justine De Newton, Quebec! Go Canada! I tried it on a few areas of my body that were bothering me. I get menstrual cramps usually for one day each month so I wanted to use my Body Pack on my lower abdomen to see if it would help. I decided to heat it up to take advantage of the thermal benefits it offers. All I did was heat it in the microwave for 2 minutes until it was warm (not too hot). It felt awesome and really did make me feel so much better. I also tried it on my lower back- on my SI joint in particularly. My pelvis is so messed up and this area causes me pain quite often. I heated up my body pack and put it over top my SI joint and it helped the muscles around it to relax and loosen up and eased some of the tension. The last area I used it on- don’t laugh now- was the top of my head. I often get headaches that start right at the top of my head so I lie in bed with the body pack resting on my head. I must look funny, but the pressure of the hug seems to help ease the pain and make it less noticeable. It’s great when I need to get some blogging work done. In fact, right now I have the Body Pack on top of my head and the Neck Wrap around the back of my neck. I must look pretty funny, but I don’t care! It feels good! I liked the natural scent and can appreciate its value for people who are scent sensitive. I still think my favourite is the Herbal Mint though! 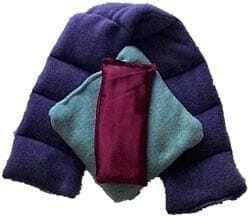 The Body Pack can be purchased from the Herbal Hugs website for $19.99. While you are there check out the other products like the Neck Wraps and the Eye Bags. Nancy has informed me that Herbal Hugs is using some organic ingredients now, but are on track to being fully organic by 2011! I’d actually like to try their Frankincense Oil. I would love to try the Herbal Hugs Eye Bag. I wanna try the lavendar oil. Would love to try the Herbal Hugs Eye Bag! I would love to try the Herbal Hug Neck Wrap! 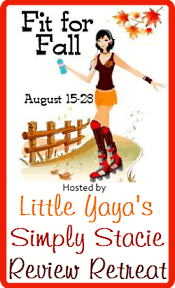 Entered Little Yaya’s Herbal Hugs Giveaway. Entered Review Retreat’s Herbal Hugs Giveaway. I would love to try the Herbal Hug Neck Wraps. Since I’m wishing: I’ll take the Herbal Hugs Gift Set. Thanks for the contest. I would love to try the eye bag. 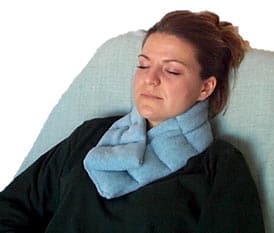 I would love to try the Herbal Hug Neck Wrap.